Saint Lucia is a constitutional monarchy with Queen Elizabeth II as head of state, represented by a governor-general. The legislature is bicameral. 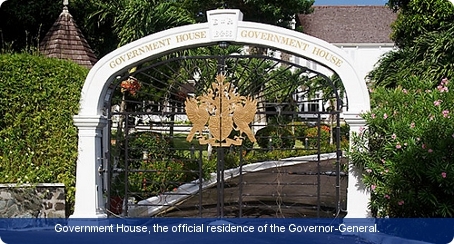 The House of Assembly has 17 directly elected members and a senate of 11 appointed members. Six of the senators are appointed by the prime minister, three by the leader of the opposition and two by the governor-general. The prime minister is the leader of the largest party in the House of Assembly. Parliament is elected for five years by universal adult suffrage. The Eastern Caribbean Supreme Court was established (as the West Indies Associated States Supreme Court) in 1967 with its headquarters in Castries in Saint Lucia, and is responsible for the administration of justice in its member states including Saint Lucia. It comprises the High Court of Justice and the Court of Appeal. The High Court has 16 justices, three of whom are permanently resident in the country and sit in the court of summary jurisdiction. Less serious cases are heard in magistrates’ courts. The Court of Appeal is itinerant. The High Court’s jurisdiction includes fundamental rights and freedoms, and constitutional issues. Saint Lucia was named by Christopher Colombus, who sighted the island on St Lucy’s day in 1502. The island has been much fought over, for instance between England and France throughout the 17th and early 18th centuries. It finally became a British Crown Colony in 1814. In 1967 Saint Lucia received a new constitution, giving full internal self-government under universal franchise. In February 1979 it became independent, with John Compton of the United Workers Party (UWP) as its first prime minister. After losing the 1979 general election to the Saint Lucia Labour Party (SLP), in 1982 the UWP was returned to power with a large majority. In March 1996, at a UWP convention, Compton lost the leadership, after 30 years, and was replaced as prime minister by Dr Vaughan Lewis. After the 1997 general election, when the SLP emerged victorious and Lewis lost his seat, Lewis resigned as leader of the UWP. In 2006 the UWP won the election and UWP leader Sir John Compton, who had since 1964 served as head of government for a total of 29 years, became prime minister. Following Compton’s death in 2007, Stephenson King, who had been acting for him during his illness, was sworn in as prime minister. In the November 2011 elections Kennedy Anthony and the SLP ousted the UWP government, winning 11 seats to the UWP’s six, and Anthony began a third term as president.